Here’s our delish paleo Crispy Chicken Recipe! This recipe is finger lickenly good – especially when served with guacamole! Mmm mmm. It’s great for entertaining and for people who don’t approve paleo… YET! Whisk eggs + egg white in a separate bowl. Season the chicken tenderloins with salt + pepper. Dip the chicken tenderloins into the dry ingredients. Dip the tenderloins into the egg mix. Dip the tenderloins once more into the dry ingredients. 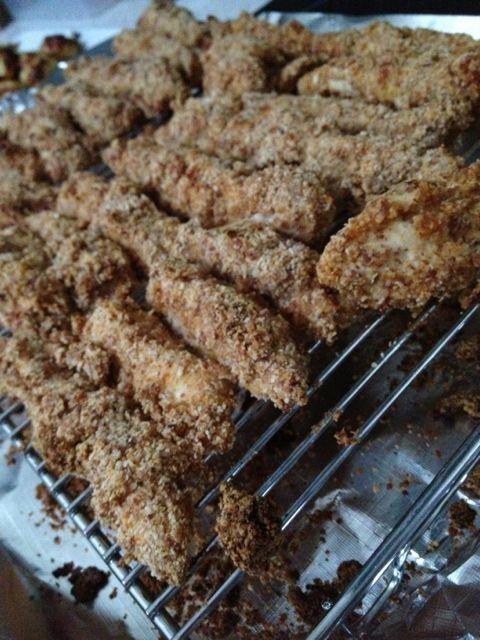 Place chicken tenderloins into heated pan + fry until golden + crispy, turning 2-3 times until cooked through.